My name is /Mr./ Souren Israilian. I’m a Chairman of The Celtic Heritage Society from Bulgaria. We have been registered since the month of April of the year 2009 in our District Court. Our main task is to inform our local people about the Celtic roots and traditions – we have had a Celtic kingdom, named The Celtic Kingdom with a capital Thile in our lands. The Celtic traditions are very similar to the Bulgarian ones – that is why we’d like to organize reconstruction of 8 Celtic Holidays here for Bulgarians and foreign visitors as unique tourist events. And I hope we’ll do it because we like it very much! As you will find, some items are written only in Bulgarian. 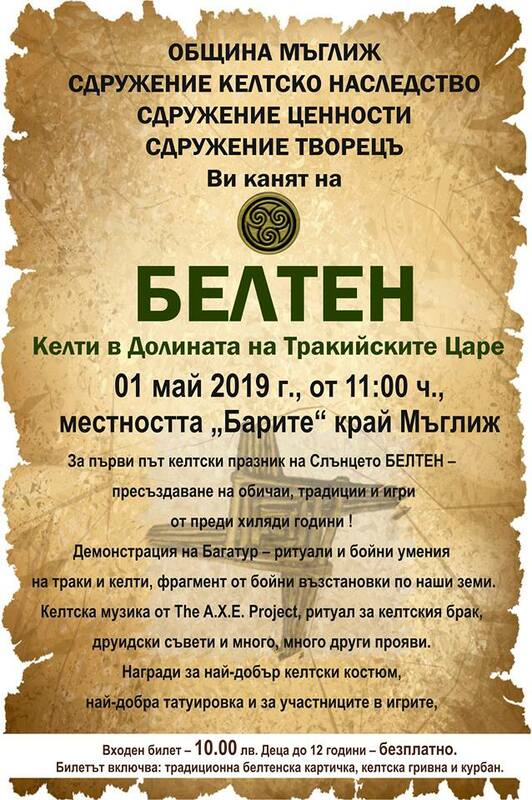 The reason is not because of some local nationalism, but our only wish to inform the Bulgarian public about Great Celtic civilization which is widely known to the English-speaking readers. We understand that, as “beginners”, maybe, we are not informing our public under the “proper rules” but the expertise comes with learning and we hope that, some day, you’ll be the one to show us “the right path”. Thank you for your understanding. If you “insist” to know what we do “hide between Bulgarian lines”, see “Contents of Bulgarian Frames”. For more, learn Bulgarian or come to see us!